LONDON, England -- The countdown to the 2010 World Cup, football's biggest carnival, began in earnest this week with the passing of the one-year anniversary to the opening game of the event. 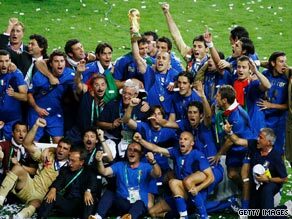 The countdown to see which side follows Italy as world champions has started in earnest. The journey to the finals is long and challenging, with 200 teams competing across six global regions for qualification to a showpiece that will eventually see only the best 31 sides take part, along with hosts South Africa. In 12 months' time, Soccer City stadium in Johannesburg, South Africa, will be packed with 90,000 cheering fans, all anticipating with relish the 64-game fixture list that will be played out across 10 stadiums between June 11 to July 11 to decide the world's best. Are you excited about the World Cup? The start of any World Cup tournament is always an event that attracts attention, but the 19th edition will have wider significance for a nation that is keen to assert itself in the post-apartheid era and a continent enjoying prominence on the world stage. Football's world governing body FIFA has been keen to bill the 2010 tournament as one that is African rather than the sole property of the host nation, with the hope that a lasting legacy from the event will be left throughout the continent. "Win in Africa, With Africa" is a project initiated by FIFA president Sepp Blatter and former South African president Thabo Mbeki with the aim of leaving "tangible benefits" for the continent. Whether the main plans of building artificial turf pitches in 25 African countries and the provision of sport-related courses in a range of African universities will be the tonic needed for a region which, according to the World Health Organization (WHO), has a life expectancy of just 50 years for males and 53 for females, remains to be seen. "In 2010 we want to increase the tourism numbers from the current nine million visitors a year to 10 million. A key factor in this World Cup is the tourism legacy and the jobs that come with it." Estimates are the event could create $21 billion in revenue along with 160,000 jobs, with the influx of tourist money being spread to neighboring countries with the likes of Botswana and Mozambique providing accommodation too. South Africa is determined to prove that a world class event can be staged on African soil successfully, and despite critical voices and concerns being raised about the host's viability -(South Africa gets ready) - the "rainbow nation" has a unique chance to showcase how vibrant, developed, forward-looking and culturally rich Africa is. Passion for football, or "diski" as it is known locally, is rife in South Africa, and though cricket and rugby remain pre-eminent, it is the "beautiful game" that has the unique power to unite the townships and top tables of business and government alike. The dress-rehearsal Confederations Cup will give a glimpse of what 2010 will bring; prepare for some African magic.